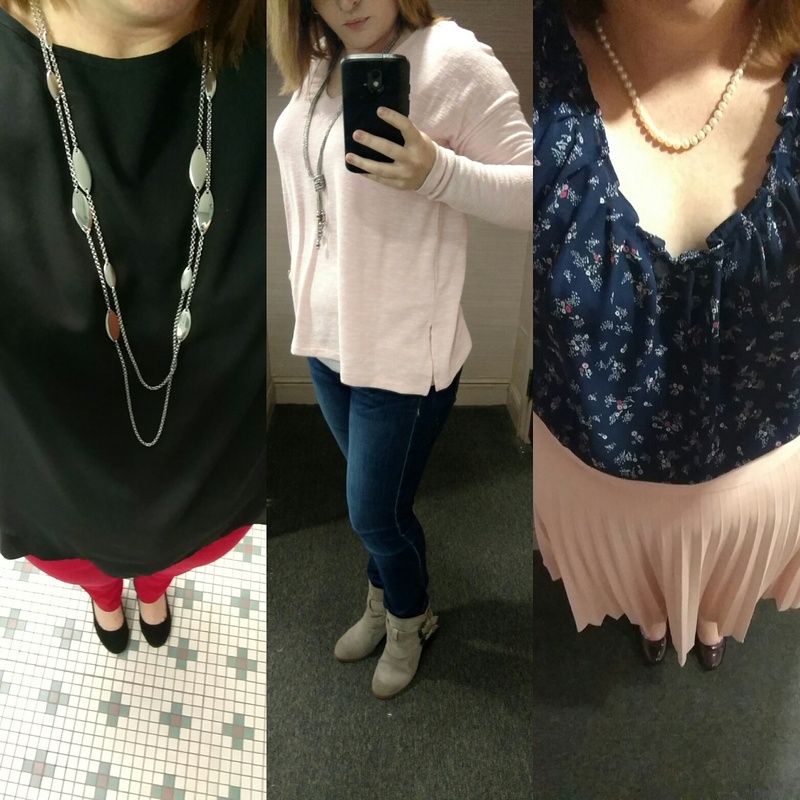 This week I've been pretty happy with the way all of my outfit choices have turned out, so I decided to share three different looks. I guess I've got Valentine's day on my brain because all of my choices have had something from the red family this week! 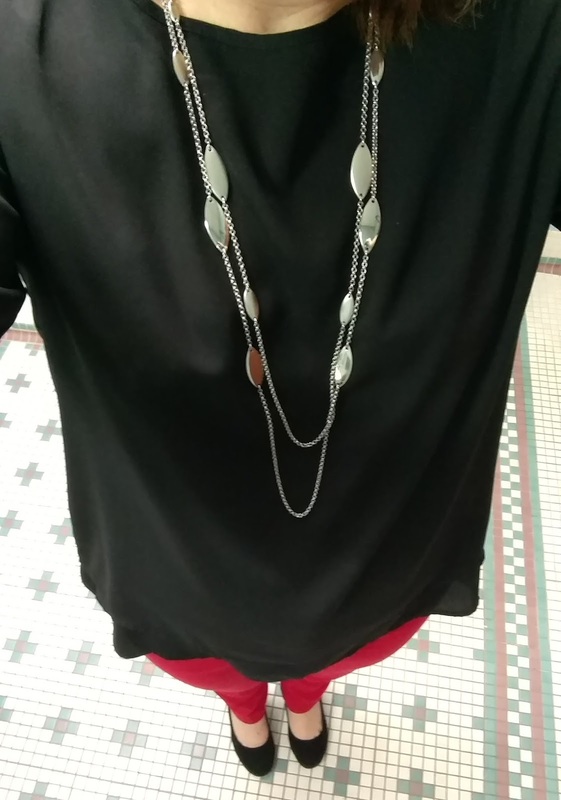 Let's start with this red and black look. These red pants were a Christmas gift, and one of my favorite items in my closet. Worthington is one of my favorite brands when it comes to work wear. These are their classic ankle pant. I'm wearing them in petite, FYI. I got the shirt on final clearance from The Limited. I already owned it in blush pink and loved it so much, I couldn't resist. It's the perfect combination of structure and flowiness. It has a silver zipper on the back, three-quarter length loose sleeves, and it's a nice light-weight fabric so I can wear it year round. I'm wearing it in petite. My black faux suede wedge pumps are one of the best shoe purchases I've ever made. I found these babies at Cato a few years ago and have worn them so much I'm about to have them resoled. 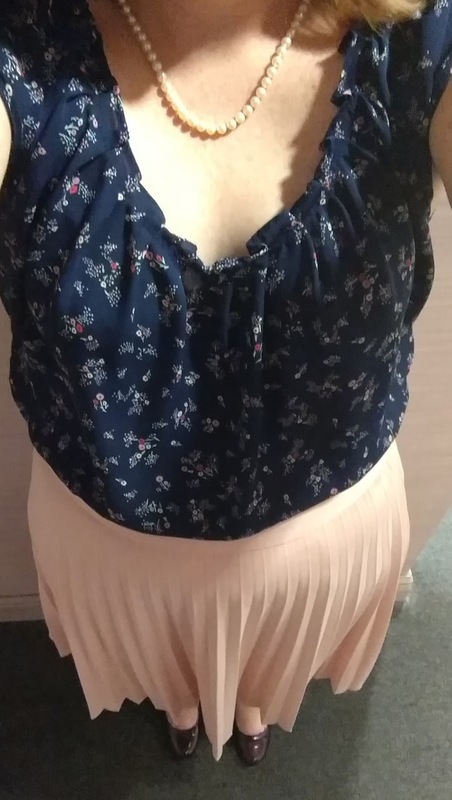 This is an outfit I find myself wearing ALL THE TIME, both to work and around town. 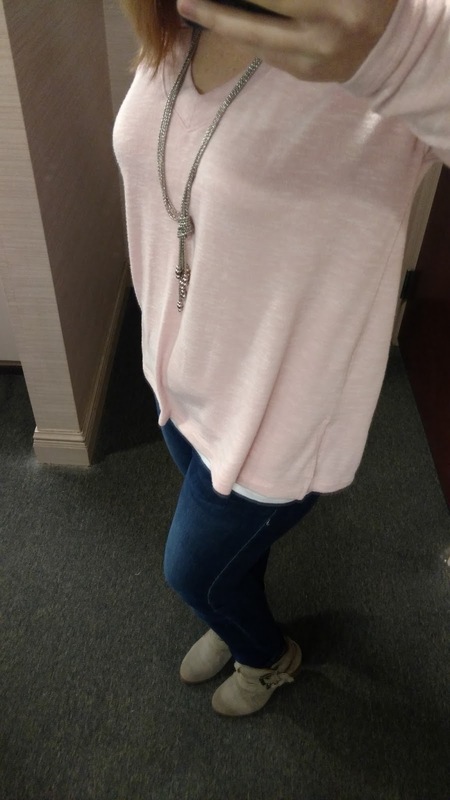 I bought this link pink oversized sweater from Old Navy during a flash sale about a month ago. The material is a little thin so I wear it with a white tank top underneath. My jeans are actually from the juniors' department at JCPenny. They're Arizona name brand. I'm wearing them in short. My ankle boots were a splurge buy but totally worth it. They're the perfect neutral shade of taupe. I literally wear them with everything. The heels are just chunky enough that they're comfortable to walk/stand in most of the day. This skirt is one of my favorite pieces in my closet. I bought it on final clearance from The Limited, and honestly I couldn't find anything remotely close to its awesomeness to link to. It hits me about halfway down my shins and is high-waisted. The shirt is by Lauren Conrad. This is a style that I really like. In fact, I have at least three different versions. The neckline is pleated; it has a tasteful tie back; and the fit just works for my body type. This is the type of shirt that looks good tucked in with a skirt or worn loose with a pair of jeans or even shorts. My shoes are one of my statement pieces. I picked them up at TJMaxx several years ago for cheap. They're super comfy and surprisingly versatile, although this is the first time I've worn them since getting pregnant. You look terrific, dear friend. Who knew you are a newsroom fashionista? :) Those outfits are stylish, look comfortable and should serve you well at the shop. I remember women who worked in the control room having to wear long pants and heavy jackets all day long because the temperature was kept around 60 degrees to protect the electronics. As for the cold temps in the control room, they're still there. Our newsroom stays pretty cool, as well. I have a blanket that stays at my desk to keep my legs/feet warm. I'm not down in the control room for long stretches of time so I'm usually OK.